Get rid of all your fancy words. Get rid of your ego. Writing effectively is not about showing off. It’s about communicating. It’s about driving actions. Write simply. Get to the point. Then stop. Because people read differently on the Web, writing for the web is not the same as writing for print. Web surfers scan and jump quickly from one piece of content to the next. Webpage visitors are much more action-orientated, and when they get online, it is to get something done. Words should always be driving actions. 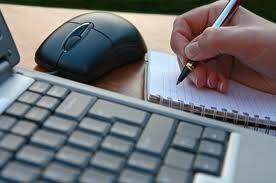 Writing for the web effectively begins with knowing your reader. Write for your reader, not for your ego. Your reader is not everybody, it is someone. The most effective writing is keenly focused on the specific needs of a clearly defined reader type. Is your reader a middle class, British female, with two kids, who lives in the suburbs? Think like your reader thinks. Get to meet her. Once a month, talk to your reader. Read what she reads. Is there a common style and tone being used to reach her? Use it. Put a picture of your readers up on your wall. You shouldn’t have more than 3-5 core reader types. Publishing is about getting the right content to the right person at the right time at the right cost. It’s about getting and keeping attention with content. It’s about driving actions. Publishing is about selling with content. Back around 1995, if you went to many airline websites, you found a big picture of an aeroplane on the homepage. Now, you will find a booking process and special offers. It is not about you, so keep your ego at bay. Killer content. The first thing publishers must get right is their killer content. What content do you have that will really drive actions? Put that on your homepage. The most powerful word in the English language is ‘YOU.’ Write from the point of view of the reader. The reader has come to your website to do something, so your content should be written in an action-orientated style. Every sentence should be moving them towards a purchase, a subscription, a solution. The Web is about links and connections. Web content is classified and linked content. Never leave your reader at a dead-end on your website. Write to be found when people are searching. That means using the words your target readership is using. Before you begin writing, you need to sit down and plan the keywords you will use in your content. See our Search Engine Optimisation page. People scan read and the first piece of content they often read is the heading. If it’s not interesting, they’re gone. The heading is often used as a title tag. This is what the search engines use on the search results page. The heading may be placed on a homepage as a link to the content. Be clear and precise. Avoid Shakespearean references. Avoid being clever. The summary is the: who, what, where, when, how. It’s about getting the facts across in 50 words or less. An objective of a summary is to make people want to read on. Keep them punchy and factual. Sentences should be between 15-20 words. Paragraphs should be between 40-70 words. Remember, people scan read. If the first sentence in the paragraph is not interesting, they’ll move on. So, always lead off a paragraph with a factual sentence. If you can’t write good copy with your specific keywords, you can’t write for the Web. Keywords give web content context. Every webpage should have a unique title that precisely describes the content on that page. Take your time. Good editing can take anything from 30-50 percent of the time it took to write the original content. Aim to do about three edits. Edit first for style and tone. Ask these questions: Is it clear? Is it necessary? Is there a shorter way to say this? Is there a simpler way to say this? Leave the checking of grammar and spelling until last. For a thorough edit, print out the content. Get a ruler. Or you could contact us now so we can help you grow even more quickly.